“The present perfect is a grammatical combination of the present tense and perfect aspect that is used to express a past event that has present consequences.” (Wikipedia, 2018) In the film of the same grammatical term, the past always has present consequences for Toey and Oat. Toey and Oat meet by happenstance – they are both traveling alone for different reasons but they end up in the same place. While Oat seems more sociably forthright, Toey is more withdrawn and reluctant. It takes some prodding by Oat to even get Toey to go to the supermarket with him. Eventually, the two start to spend more time together. It’s a little cliché, but the beginning of the drama starts with drunkenness and passing out together. What happens when you wake up next to someone and don’t remember what happened? This is the start of another journey for Toey as he tries to figure out what happened and how he feels about it. There is an interesting metaphor with Natto which are fermented soybeans. They come in a package and to be honest, they don’t look all that appetizing. When Toey first tries them he spits them out. Later his friend shows him how to make them better. When he tries them again he likes them. The first time Toey is with Oat he is confused and upset with himself. But then if he tries it again will he like it the second time? I found some of the filmmaker’s (Anusorn Soisa-Ngim) notes on the Indiegogo website: “This film is not the typical romantic comedy film; it is a film of courage, love, and acceptance.” I can certainly see this in the characters’ development. Toey especially must find the courage to try something different than he was expecting or that he was used to. And both are on a trip with a planned end, which begs the question do you let yourself get involved knowing that the end is coming? 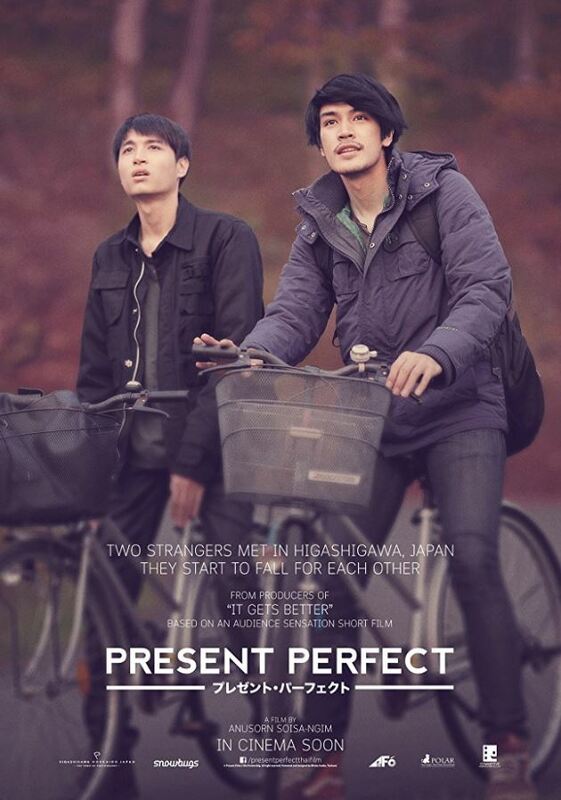 Present Perfect is a simple film. There isn’t a lot of dialogue, and there are a lot of long looks between Toey and Oat. The cinematography is beautiful, and production values are good. There are some things here like the cultural denial of LGBT relationships that other films have touched on (The Last Match, Floating Skycrapers), but this film tries to add a depth to the characters that is more reflective and introspective.